How many top D-III college players can the ultimate community name? How many powerful careers of female Division III athletes have been followed with excitement and anticipation? As we learn about, watch, and follow D-III more closely, one name you should get used to hearing more often is that of St Olaf Vortex’s #14 Tulsa Douglas. With praise like that, it’s not hard to wonder what kinds of actions will elevate Douglas to join such a pantheon of respected athletes. From her gameplay on the ultimate field to her leadership off of it, Douglas will make you learn her name in the coming months and years, starting right now in the D-III Women’s division. Douglas began playing ultimate at a young age in Amherst, Massachusetts, a city known for its large and active ultimate scene. The sport was already part of the family roots: her father played in college at Colby and New Hampshire. While in middle school, she attended a girls-only camp directed by Booth. “It was a truly special opportunity to have about 20 young girls attend an ultimate camp, which I hadn’t realized until recently,” said Douglas. Having an all-girls ultimate learning opportunity can be an incredible resource for young female athletes entering the sport. In Douglas’ case, she was surrounded by tremendous ultimate players and counselors like Amber Sinicrope and Emily and Lauren Baecher. Douglas remembers “looking up to them a lot, both as players and as mature high schoolers.” Even though she didn’t love ultimate at first, the environment made her feel comfortable and excited, unlike previous experiences with other co-ed sports camps. Douglas is not sure she would have opted to play in the local recreational league in ninth grade without that early exposure. She couldn’t say she would have even tried out for her high school team. At the same time, she found the league games to be stressful, even as she recognized and wanted to pursue her personal growth in ultimate. Nevertheless, Douglas continued to play and try out out for her high school team. After a year of playing on the junior varsity team at Amherst Regional High School, Doulgas was determined to make the varsity squad. Her league teammates were a great influence in helping her build up the confidence that she exhibits today. Her teammates helped her see the field, reminding her that she had ten seconds with the disc. Those teammates told her it was helpful to take a deep breath after catching the disc in order to relax. In the pre-season, she attended spring workouts led by players like Katy Peake, Hannah Yee, and Angela Zhu, growing her confidence around the disc. She competed with BUDA’s YCC team during the summers, increasing her reps on the field. All of these helped her reach her goal—the varsity ultimate team. Even with the determined attitude she’s had throughout her career so far, Douglas attributes her early success to the Amherst community that introduced her to the sport. What brought Douglas to the sport were the people: the positive and meaningful experiences with teammates and coaches at all levels were valuable, particularly in comparison to the other sports that she had participated in like soccer. The ultimate community enabled her to reach her early goals in her high school career, helping her take first steps on the path to becoming an elite college and club ultimate player. Douglas’ choice in secondary education after high school was determined by a few factors. She wanted a small liberal arts school with a women’s ultimate program that was outside of the Northeast. St. Olaf College in Northfield, Minnesota, fit the bill. And there she’s stayed. She is currently in her senior year studying exercise science. Her time with the women’s ultimate team, St. Olaf Vortex, has served as a natural place to apply her passion for sports psychology. Vortex got their team name from the severe wind conditions the North Central region faces, conditions in which the team has found themselves wasting mental energy discussing the weather. Douglas introduced the idea of uncontrollables to the team; athletes shouldn’t focus on what they can not directly control. Moving a group of athletes into this mindset has been a difficult feat, but with the support of fellow leaders and her team, Vortex improved their mental and on-field game. The toughness developed across Vortex has also been reflected and echoed on the individual by players. Douglas, along with her fellow captains, shared mental toughness literature on developing a performance statement, identity statement, and mantra. Many of her college teammates still use these ideas when they compete. She encouraged each member of the team to create an ID statement, a self-statement designated to improve self-image. These statements begin with “I am…” and are reflective of the athlete’s true belief in their abilities and motivates the behaviors necessary to live out these expectations. For Douglas, a D-line handler, her ID statement reads, “I am an aggressive defender. My opponent will not get the disc.” She’s also developed a performance statement, a single fundamental idea that allows her to simplify the game and focus on what allows her to be successful. Hers is simple: “MINE”. Douglas brought more than mental and personal improvement to Vortex. She has been a critical on-field producer for the team. She helped lead Vortex in 2015 to the D-III College Championships with her offensive and defensive talents and was named to the North Central All-Freshman team. In 2016, Doulgas was named Player of the Year in the D-III North Central. Vortex returned to Nationals and tied for third, the highest finish in program history. She also threw an incredible 29 assists over the tournament weekend. In 2017, Douglas played Nationals weekend while injured, and still threw a whopping 20 assists while Vortex tied for seventh. Douglas was also nominated and made a finalist for the inaugural Donovan Award last season. Her team was also honored as a five-star Achieving College Excellence (ACE) Program recipient, the top-level designation bestowed by USA Ultimate on teams based on their alignment with the three C’s—Character, Community and Competition–of the USAU mission statement. St. Olaf’s success during Douglas’ time is not a coincidence—she has been an essential part in creating that success. Emma Keiski, a former co-captain with Douglas at St. Olaf, praised Douglas for not only being the best player St. Olaf’s program has ever seen on the field, but for her continual investment in other players. 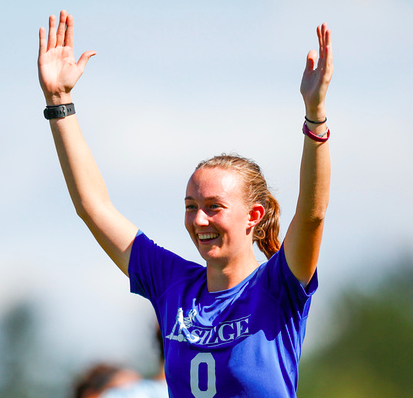 Beyond college ultimate, Douglas was a part of the United States successes as a member of the Women’s U24 Gold Medal Team that competed in Perth, Australia, in January of this year. Worlds teammates such as Keila Strick also recognize and praise Douglas’ mature mental game, especially in how it elevates her as a defender. Douglas recently reflected on her application process to the Worlds team. Even with her accolades in D-III, she was nervous and even somewhat intimidating when playing against and going up for roster spots against well-known Division I names like Jaclyn Verzuh or Carolyn Normile. Beyond the pitch, Douglas has found other ways to lead within the ultimate community. Douglas is passionate for promoting and participating in ongoing gender equity and intersectionality conversations with her St. Olaf and Brute Squad teammates. You might also recognize her as one of the organizers of the 28 Days of Food, Frisbee and Feminism Facebook group, helping foster conversations about women in ultimate by bringing people together within their own spaces. Douglas admits that at the time she was selecting a college, she didn’t fully recognize the difference between D-I and D-III ultimate programs. In the end, though, she has been happy with her choice in school and program. For her, D-III programs have just as great an opportunity to grow a strong, competitive community within themselves as larger schools. Vortex, in particular, has given her an amazing opportunity to grow as both an athlete and a leader in her community. Douglas faces challenges in the smaller division, like navigating the different commitment levels and priorities of the players on the team. Many small, liberal arts schools have a very active student base; as a captain, Douglas’ decisions must represent the team and its commitment level as a whole. It’s a delicate balance of scheduling the appropriate number of practices and tournaments while also utilizing the limited field space available. Though the women’s ultimate program is the schools most successful club sport, balancing their budget and the difficulties of practice space is almost a rite of passage for captains like Douglas, just as it is in many other college ultimate programs. “A smaller school and division, does not mean a lesser program – just an opportunity to grow and develop players on a smaller scale,” Douglas said. She explained that she believes there is a special opportunity and benefit that D-III schools provide in cultivating talent and community. In her personal experience when trying out for the U-24 World’s Team, Douglas focused on the skills she gained from D-III competition: enhancing her arsenal of throws, increasing her reps with the disc, and developing her favorite throw, a backhand break. Douglas believes that the competitive gap is capable of closing between the two divisions as the number of D-III women’s programs continues to grow. 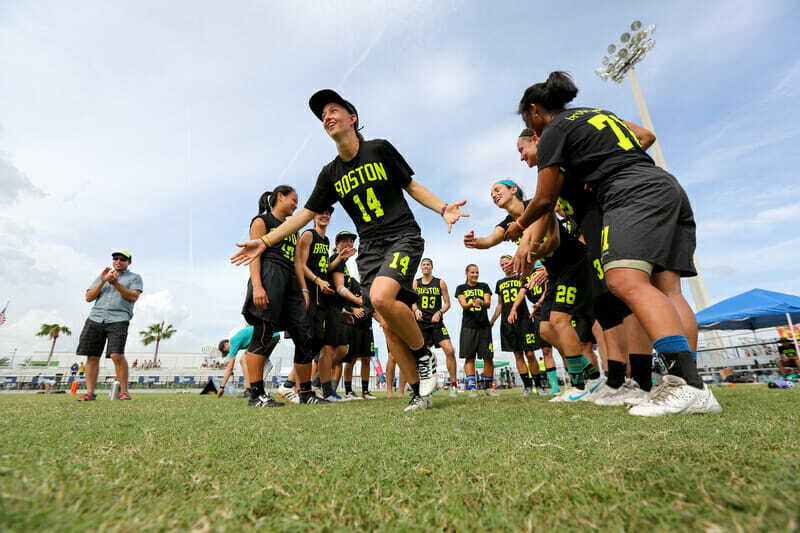 She is hopeful that high school athletes can find the right fit for themselves in the college ultimate community—specifically in D-III ultimate. More consistent media coverage is now showcasing D-III ultimate, exposing the community to more programs and the talented athletes they are, at current, quietly producing. Douglas sees the division growing from this coverage and providing more opportunities for smaller programs to expand and compete on a bigger stage. The 2018 college and club seasons have Douglas full of excitement for what is to come. St. Olaf will be competing this weekend, looking to claim the lone bid to Nationals in Rockford. Off the field, Douglas plans to continue gender equity conversations with her team to support the goals and decisions of her teammates. As a member of the Gender Equity Squad on Brute Squad, Douglas believes ultimate is in a place where the community can grow men’s and women’s sports at the same time, together. For Vortex, Douglas is excited to work on being a center handler, taking more calculated shots, and bringing her senior year experience back to Brute Squad in the summer. With the strength of her D-III career, and one Worlds and a season of elite club experience under her belt, Tulsa Douglas is ready to see what 2018 will bring, and we will be watching. 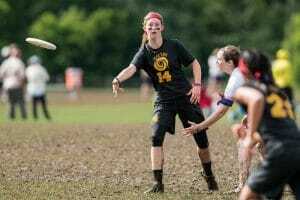 Genevieve Leo has been playing ultimate since 2012, starting her career with CUA's Nun Betta and various club teams in the NY, Philly, and DMV area. 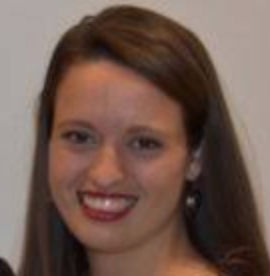 She is currently based in Washington, DC focusing on equity in ultimate - starting with coverage of the DIII Women's division. You can reach her on twitter (@GenevieveTerese). Comments on "A Powerful Name To Know: Tulsa Douglas"